The Museum of London is an old favourite, but its eastern outlier at No 1 Warehouse, West India Dock was new to me ( Docklands Light Railway, West India Dock station, or Canary Wharf, Jubilee line ). Located most suitably in No. 1 Warehouse on the dockside quay it is FREE to enter and well worth a visit. 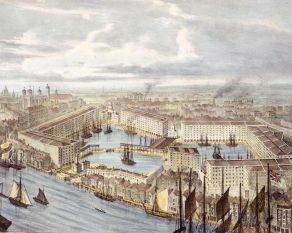 Begin on the third, top, floor, which houses some of the old warehouse equipment and where the goods, often sugar, bananas and spices – this is West India Dock, after all – would have been stored. The galleries here take the visitor back to the earliest Port of London, the so-called Legal Quays, since replaced by St Katherine’s Dock, which ran from the Bridge to the Tower, a place where ships have docked since Roman times. It doesn’t duck the origins of much of the capital which funded the industrial revolution and the expansion of empire, with informative and evocative galleries on Slavery and how the Slave Trade worked. The remaining galleries on the top floor concentrate on the development of docklands, the building of new docks on the Isle of Dogs as London becomes the hub of world trade. 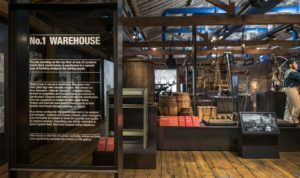 The second floor looks at how it worked, the customs men, the organisation of docklands labour and the further development of the Port. West India Dock, Canary Wharf and then St Katherine’s Dock, to replace the old Legal Quays, between the Tower and the Bridge. 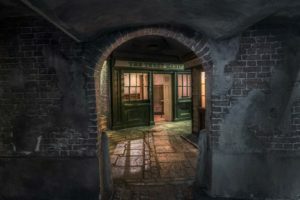 ‘Sailortown’ is evocative of the world behind the docks, a recreation of the tiny, lightless alleyways, cobbled streets and the support services and associated trades, ship’s chandlers, general merchants, dealers in wild animals and the exotic. Be aware of the uneven floor here – not good for those with mobility issues. There are galleries which document Docklands in the twentieth century, particularly during WWII when the Luftwaffe targeted the docks in unceasing bombing raids. The history of the East End during this time has been oft-repeated, but still there were facts which were new to me. 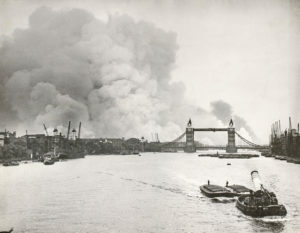 In 1940 the firestorm in the docks lasted for eighteen days straight, with wardens and fire crews unable to dowse all the fires during the daytime, before the bombing and the incendiaries began again at night. Imperial War Museum footage shows the crews fighting the fires. Then to the decline of the docks as container ports attract their trade and the old warehouse buildings crumble. This was an era in which docklands was a regular backdrop to TV shows and films of the ’60s, ’70s and ’80s. Then the period of regeneration. I remember these docklands, visiting a friend’s parents pub on the Island, on Westferry Road and long since replaced by expensive apartments. 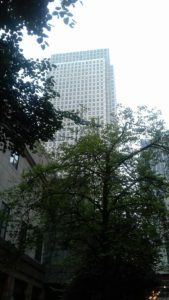 Then going up the unfinished Canary Wharf Tower with the London Society to feel very queasy on the top floor (open to the elements). Finally there is the latest incarnation of docklands, as financial and media centre, the former for most of Europe ( at least for the present ). I was surprised that there wasn’t more on this – the Docklands Development Corporation and successive bankruptcies, before the docklands of today emerged. This is a museum which has sprung out of Docklands itself, located in a building where much of the history it documents actually took place. For an engaging and entertaining FREE day out, especially good for families, visit The Museum of London at Docklands.